The ELSO writing and speaking courses are not basic ESL courses, but courses designed to help multilingual students put their English language knowledge to work for the purposes of graduate school and professional life. These courses provide space for international multilingual graduate students to learn a range of strategies, practice skills in a low-stakes setting, and form community with peers from across fields and professions in a supportive atmosphere. All Cornell international graduate and professional students who are able to enroll in courses through Student Center may enroll in ELSO courses. Students who are not able to enroll through Student Center (i.e. Continuing Education students, visiting students who do not pay tuition to Cornell, visiting students who are classified as undergraduates at Cornell but are registered in graduate degree programs in their home countries) should contact the course instructor for permission to enroll in the course. Typically, permission is only granted if seats are unfilled on the first day of class. Students are not permitted to audit ELSO courses. Students must be in attendance during the first or second class meeting to participate in the course. If a course is full, you may email the course instructor to be put on a waitlist. Waitlisted students should attend the course on the first day of class. If seats open on the first day, the instructor will add students according to their position on the waitlist and who are present in class that day. ELSO courses are 7-weeks, S/U, and credit-bearing (1.5 credits). Though ELSO courses are credit-bearing, individual programs determine whether those credits may apply toward degree requirements or for elective credit. Questions about how these credits are applied should be directed to the GFA or degree program director. ELSO courses have attendance policies. Typically, no more than one absence is permitted for 7-week courses that meet once a week and not more than two absences are permitted for 7-week courses that meet twice a week. If more absences are anticipated, speak to the course instructor before enrolling in the course to see if exceptions may be granted. ELSO 6210 Improving Pronunciation: When we think about pronunciation, we often think about individual sounds, but other features of speech are often more important for making oneself understood. These features, such as pausing, intonation and stress, make up the melody of English. By the end of this course, students will increase their awareness of and control over the aspects of spoken English that most affect intelligibility, gain confidence for being understood by listeners, and develop strategies for more self-directed learning beyond the course. ELSO 6220 Taking Part in Discussions: In academia, students participate in discussions to share knowledge, create new knowledge, and challenge ideas. This course gives students strategies and practice working in range of discussion contexts, from one-on-one to planning and leading class discussions. By the end of this course, students will have learned strategies for preparing for, entering in, responding to, and leading different types of discussions, as well as gain more confidence to assert their voices. ELSO 6230 Designing and Delivering Effective Presentations: Whether presenting for seminars, journal club meetings, conferences, or in classes, being comfortable presenting is an essential part of graduate studies. This course will provide students with strategies for preparing and delivering presentations that are clear, compelling, persuasive, concise, and visually effective, as well as offer opportunities to practice delivering presentations in front of a supportive audience. ELSO 6510 Writing, Revising, and Editing: During this course, students focus on a small writing project while learning strategies for developing a more effective writing process, engaging in peer review, and using features of academic style. By the end of this course, students will be writing in English with more ease, have a range of writing strategies, be more familiar with writing resources at Cornell and online, and be better prepared to face their next writing project. ELSO 6520 Strategies for Writing in Your Field: One of the greatest challenges of graduate school is learning the writing practices of your discipline: learning how to write with the processes, in the structures and styles, and with the rhetorical moves favored by the field. How do people learn to write as “disciplinary insiders” when writing for the field is so infrequently taught? This course introduces strategies for learning discipline-specific writing: such as learning from experienced writers in the field, identifying resources that support writing in their field, and answering questions about writing through the analysis of published texts in the field. ELSO 6530 Becoming a Better Editor of Your Work: This course introduces a range of strategies for identifying and addressing issues related to organization, syntax, style, usage, and grammar. Students apply these strategies to texts that they have already written or are currently working on (e.g. research paper, thesis, dissertation chapter). By the end of this course, students will have more awareness of the choices writers make as they work at the paragraph, sentence, and word level to communicate clearly to readers. ELSO 6540 Advanced Academic Writing--Writing with Sources: To write academic papers with sophistication, you must know how to write effectively with sources--how to read papers strategically, take effective notes, integrate source material into your prose, and build an argument based on sources. This course focuses on strategies related to writing with sources, which you may apply directly to a current project, such as a proposal, research paper, or thesis. By the end of this course, you will understand how to effectively use source material in your writing while avoiding plagiarism and keeping your voice in the forefront. ELSO 6580 Research Paper Writers Workshop: This course is designed to assist international graduate and professional students in making progress on writing a research paper (i.e. an article for publication, dissertation chapter, seminar paper, conference paper) by providing strategies for moving through a research writing project, structured writing time, access to resources, and a supportive peer community. 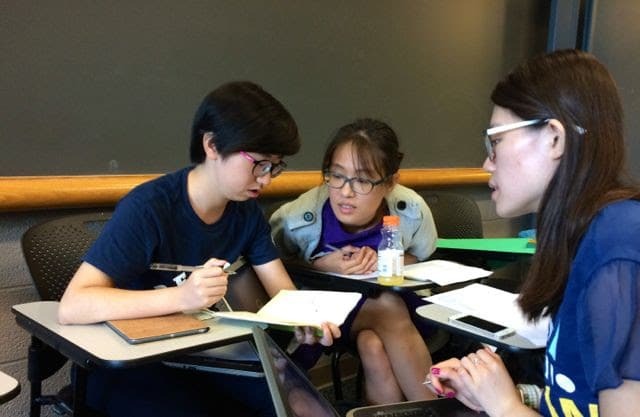 Each week, writers will set and report on writing goals, participate in discussions about research writing, and have the option to use the rest of the class meeting time to write, learn about specific aspects of research writing, and/or meet with the instructor for individual consultations —whatever would best help them make progress on their research paper. This course is enrolled by permission of the instructor. ELSO 6590 Thesis and Dissertation Writers Workshop: This course is designed to assist international writers in making progress on theses and dissertations by providing structured writing time, access to resources, and a supportive peer community. Each week, writers will set and report on writing goals, participate in discussions about writing, and have the option to use class time to write, learn about specific aspects of thesis/dissertation writing, and/or meet with the instructor for individual consultations —whatever would best help them make progress on their writing. This course is enrolled by permission of the instructor. ELSO 6610 Communicating in the Workplace: This course is designed for international graduate and professionalstudents who will need to communicate in English in professional contexts. Students will learn about differences between academic and workplace writing, explore North American workplace culture, investigate writing practices in particular professions, and gain experience with oral and written professional communication through a team project. ELSO 6620 Preparing for the Professional Job Search:This course introduces a series of professional job application steps, including the giving elevator pitches, networking, searching for jobs, interpreting job ads, attending job fairs, making digital profiles, writing resumes and cover letters, interviewing, and becoming familiar with relevant resources. By the end of this course, students will be aware of the different dimensions of applying for professional jobs, including their cultural and linguistic implications. This course will be useful to students to develop their job application documents and skills. ELSO 6630 Preparing for the Academic Job Search: This course is designed to assist advanced international doctoral students as they prepare to apply for academic positions. Students will learn strategies for planning an academic job search, developing application materials (i.e. CVs, application letters, teaching statements, and research statements), and preparing for first- and second-stage interviews. This course would be useful to students who are just starting to become acquainted with the academic job search process as well as those preparing to apply for positions the following fall. Students may enroll in fall 2019 courses during the pre-rollment period (April 10-12) or the add period (opens August 20). If a course is full, you may contact the course instructor to be added to the waitlist. You may also attend the first day of class to see if seats have opened. * ELSO 6580 Research Paper Writers Workshop is enrolled by permission of the instructor. To complete an application, click here.